The day after the Hallowe'en and Vine show last September, Amelia Schaefer, Tracy Dombroski, Lori Rudolph, and myself stopped of at Berkley on our way to San Francisco. We were window shopping but also were looking for supplies for future work. Everyone asked if I minded going to "Castle in the Air". I had never heard of it but said not to worry I would go where ever everyone else went. I am so glad that I was taken there! 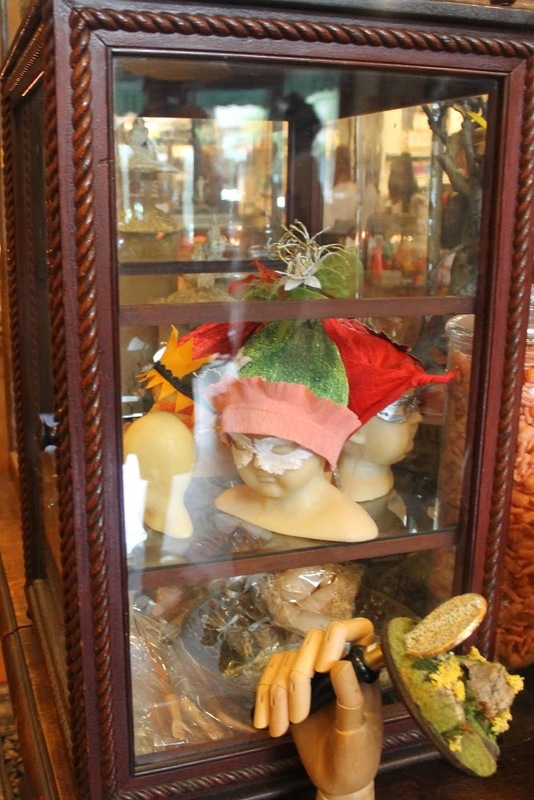 This charming window display greeted us as we entered the store. Just to warn you, this is going to be a long blog post. There was so much to look at and so much to photograph that it was hard to cut out excess photos. 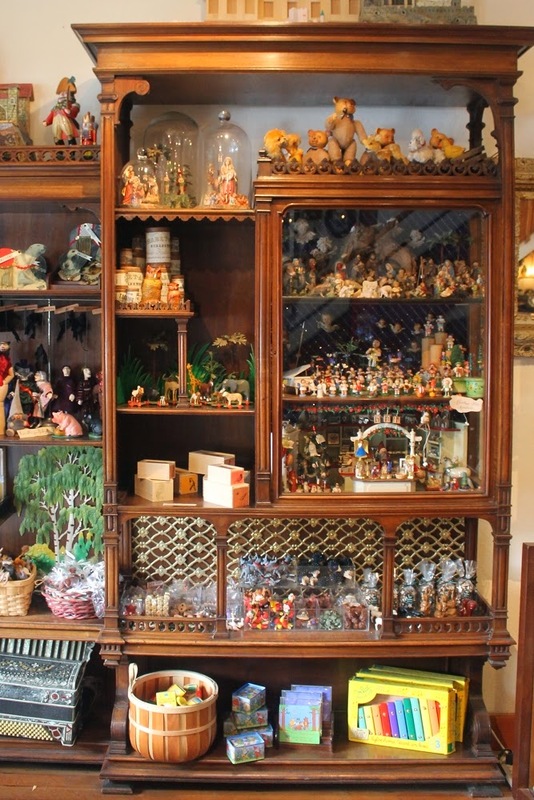 The first thing that you see when you enter the store is this antique shelving unit filled with German toys. and sealing wax in a rainbow of colours! 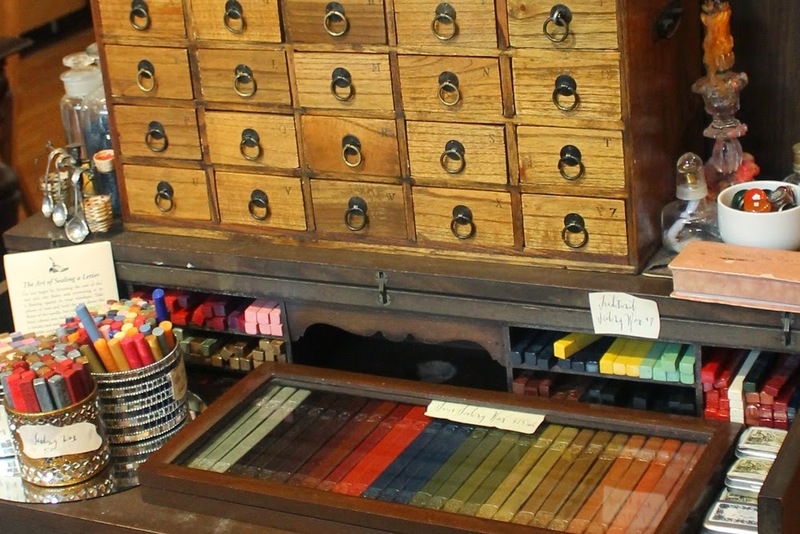 There is German crepe paper in a dizzying array of colours. 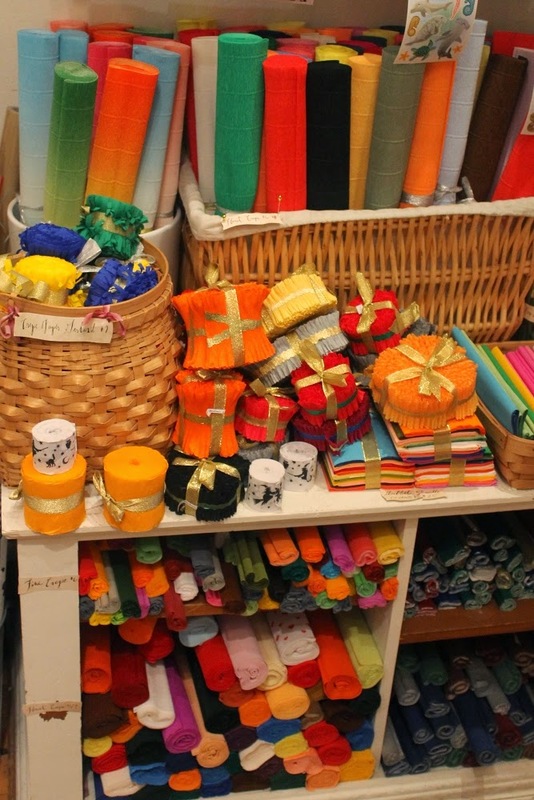 Those bundles wrapped in gold ribbon are antique crepe paper streamers. 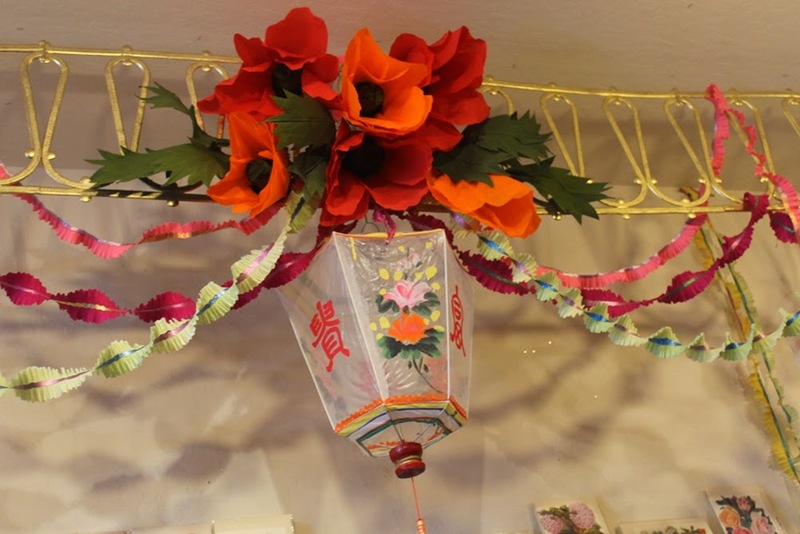 The streamers are 3" and 5" wide, I think, with a 1/4" gold paper band sewn along the centre. I covet those I will confess. 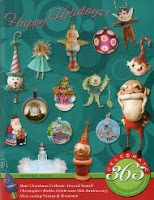 They are not inexpensive but I still would love them, so instead I will use them as inspiration for my work. 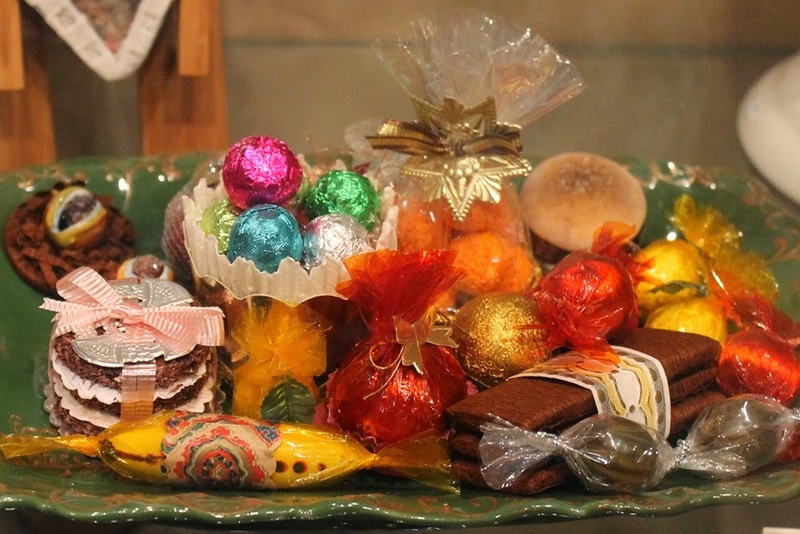 You can take a course on how to make faux candy. 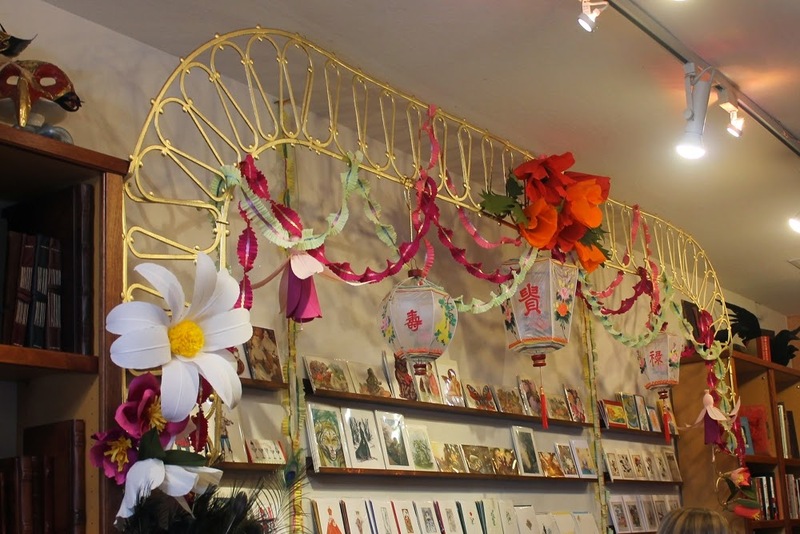 Their card display was decorated with giant gold card Dresden trim, those lovely antique garlands, Giant handmade crepe paper flowers, and vintage silk lanterns. 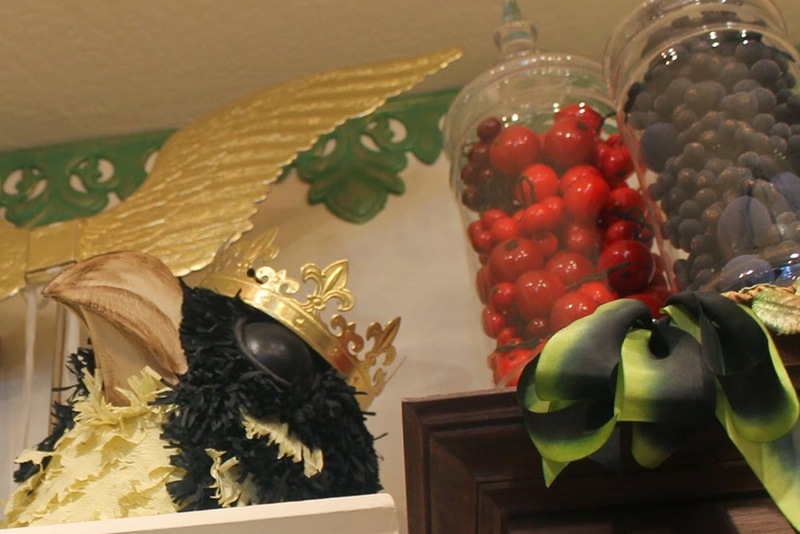 Here is a close-up of the central part of the display, I love it! The store presentation of the merchandise is top notch. 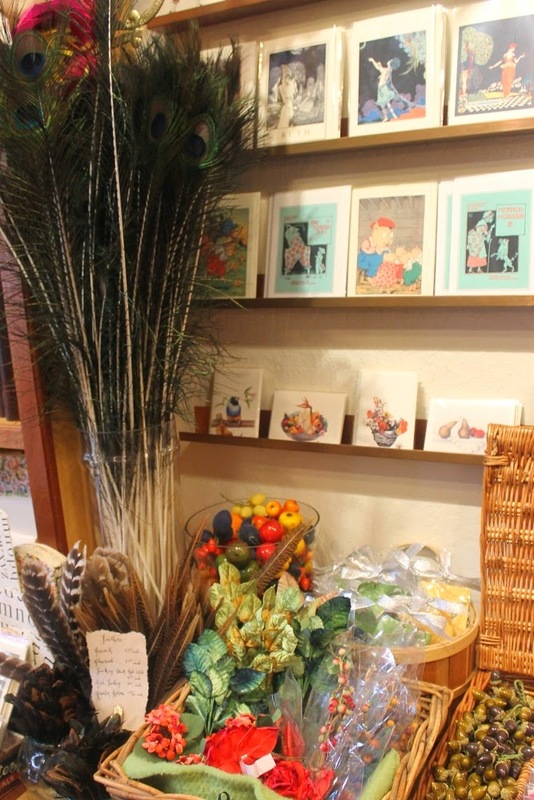 There is enough cotton batting fruit from Germany to fill a faux fruit stall. 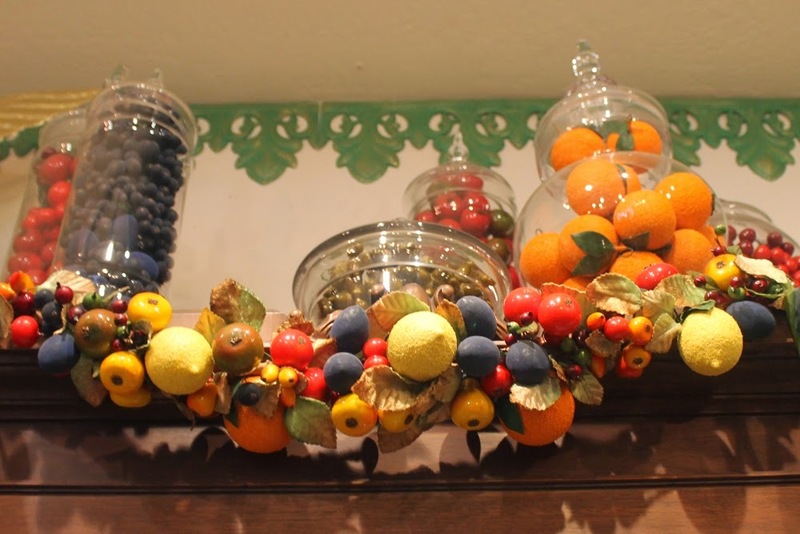 Up in behind the glass canisters of fruit is more of the card Dresden trim from Germany. That bird mask is wonderful but I want a pair or two of those wings! 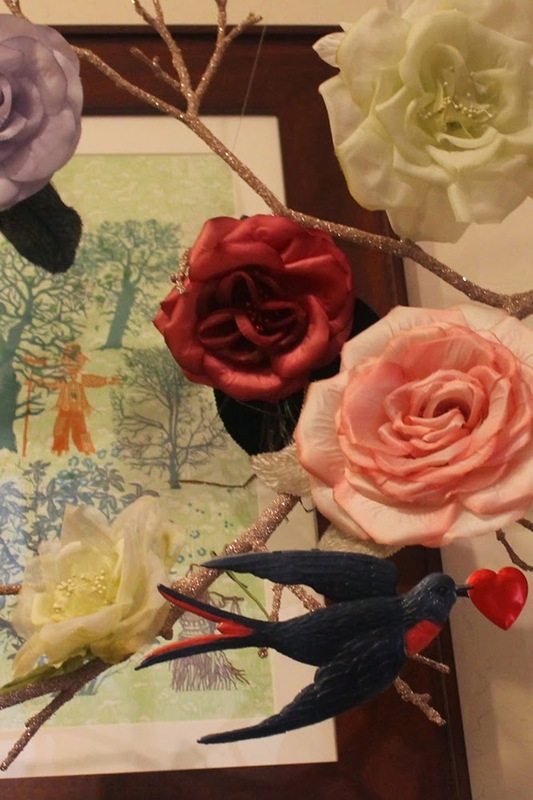 Vintage millenary flowers, feathers, and cotton fruit from Germany for sale. 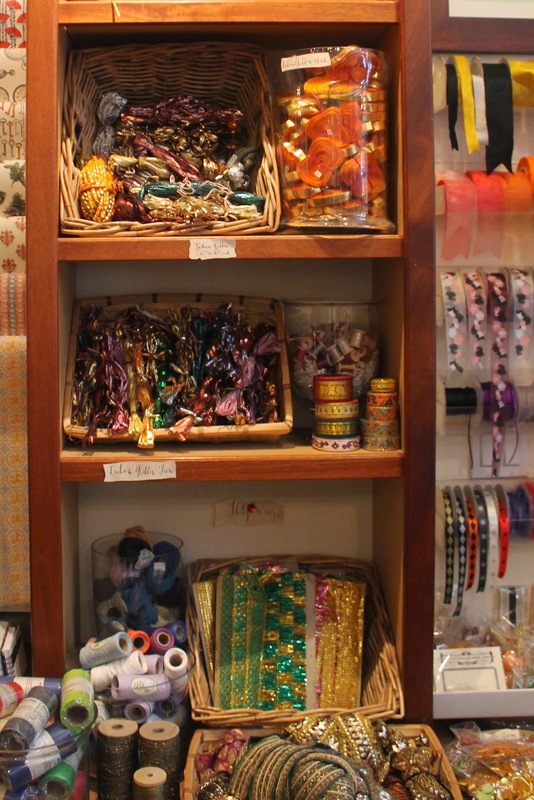 There are skeins and rolls of East Indian ribbon to entice you. 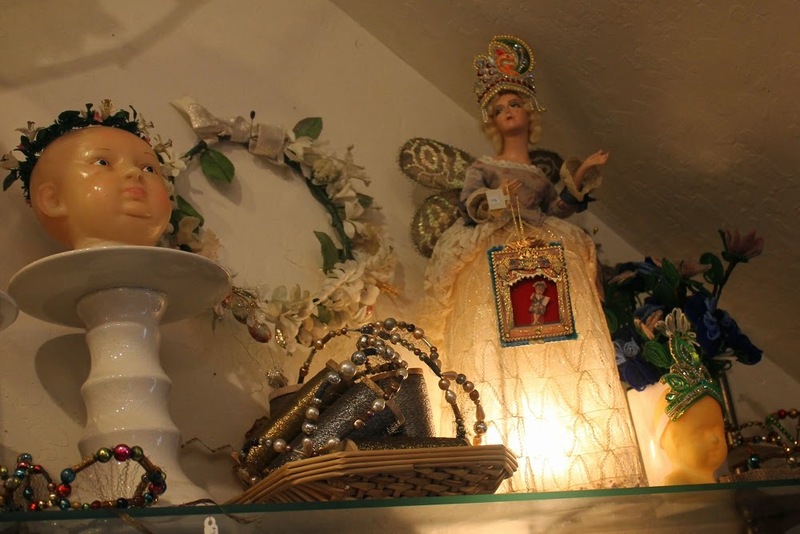 vintage blown glass bead and floral crowns, fairy lamps, and many other delightful handmade curios. 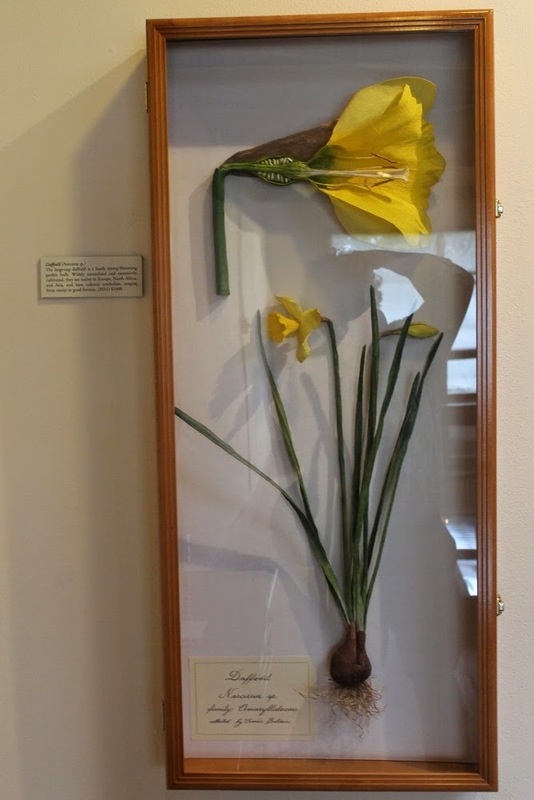 Upstairs in the gallery are samples of work done by instructors of some of the classes. 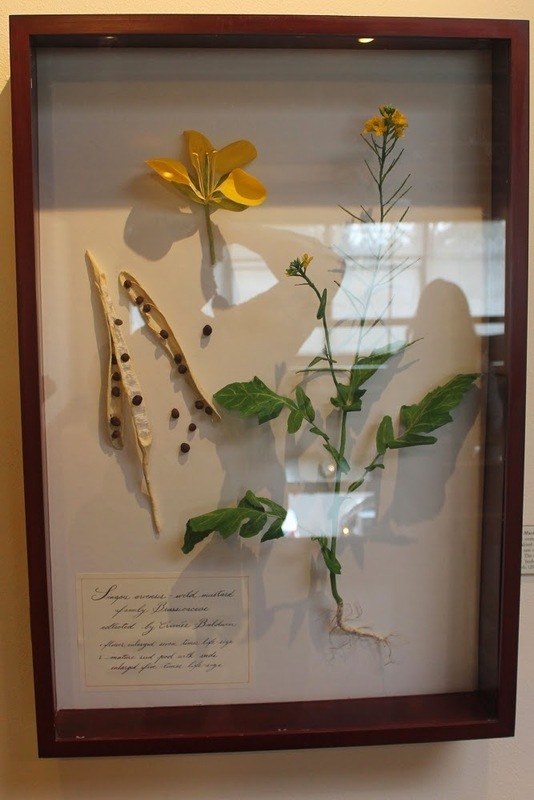 This botanical study is about 3' high and is made from the German crepe paper the shop sells. Here is another botanical study. 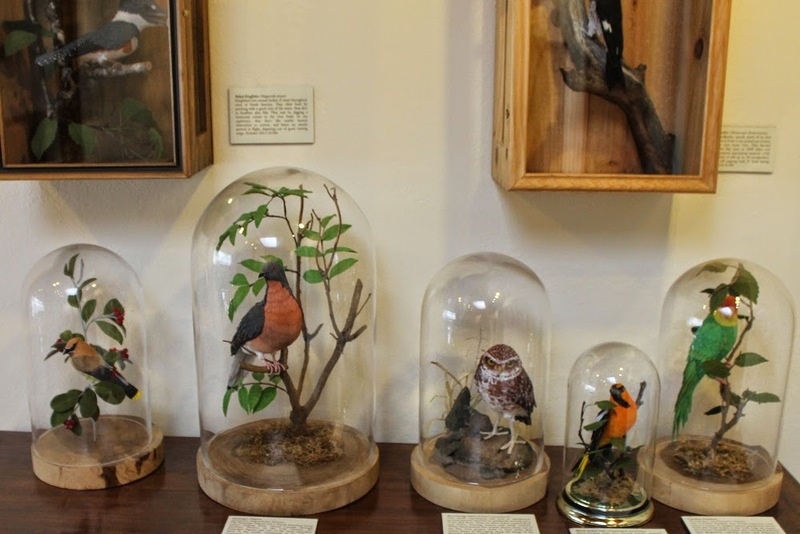 All of these birds under the glass domes on the table are referred to as Vegan taxidermy, they are created with the same German crepe paper as is used to make flowers. 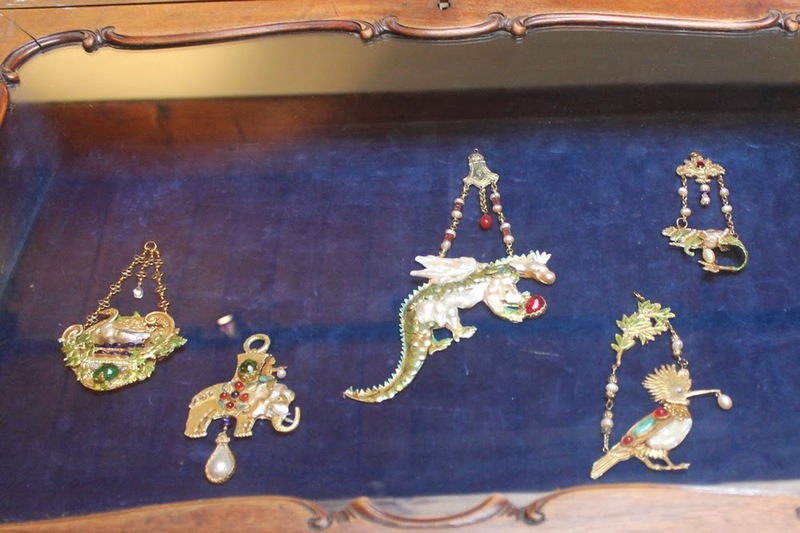 Ornate antique Mardi Gras style jewelry created from German Dresden scraps, beads, and chains. 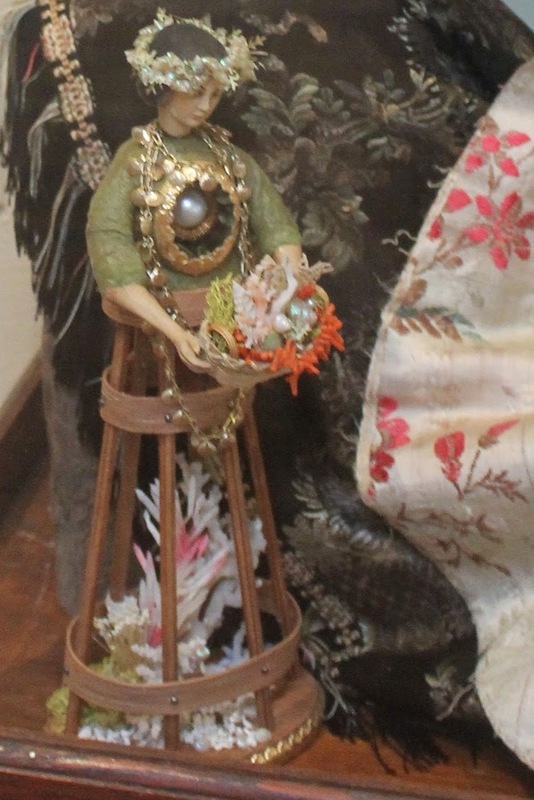 A santos figure with a seaside theme. 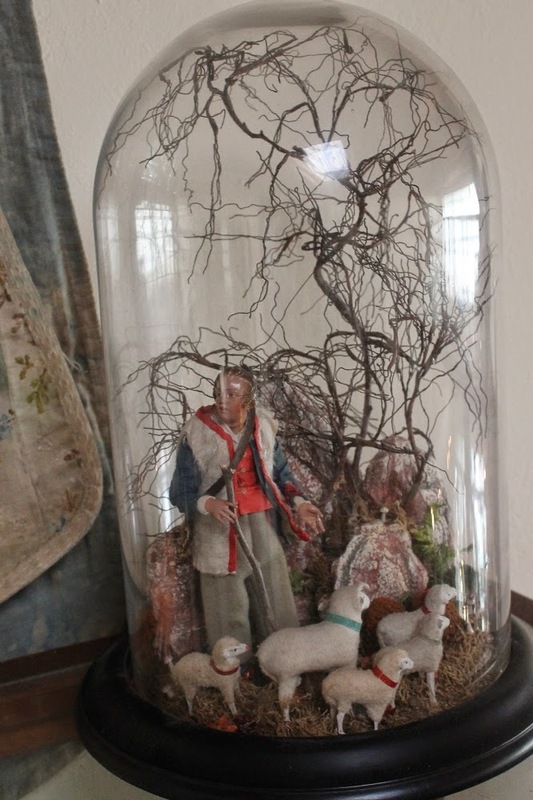 This vignette of a shepherd and his sheep under a glass dome looks like it has been caught in time. 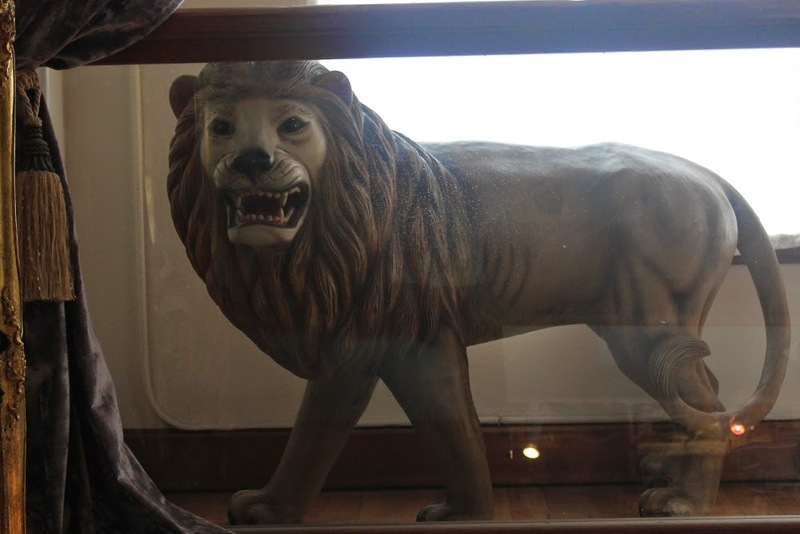 When you reach the top of the stairs to the gallery and turn to face the street there is this lovely huge carved lion facing you. 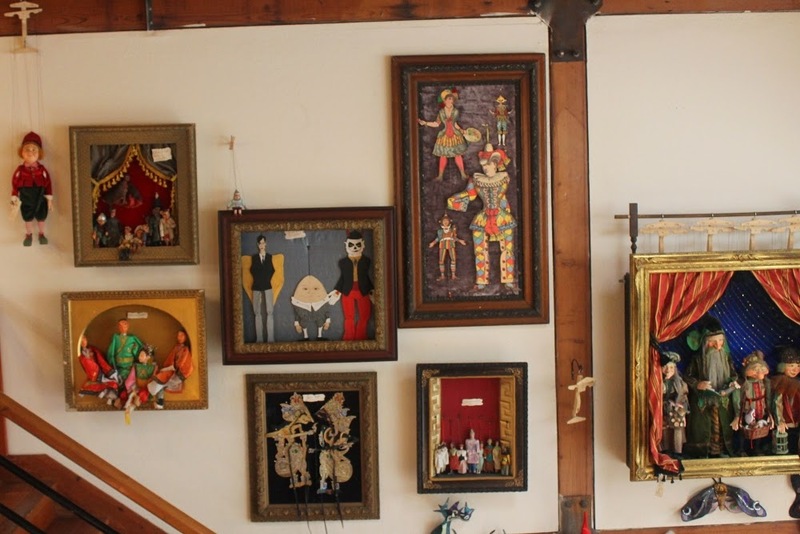 On the wall that leads up to the gallery are examples of marionettes and theatre vignettes. Castle in the Air is located in Berkeley, California at 1805 4th Street. What an amazing store! Nothing like that near where I live. 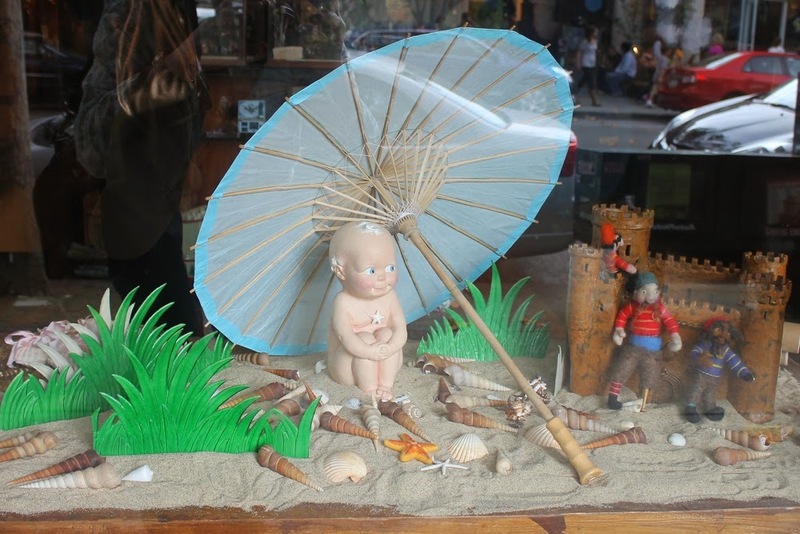 That Kewpie in the front window makes my heart melt! There is nothing like that here either. 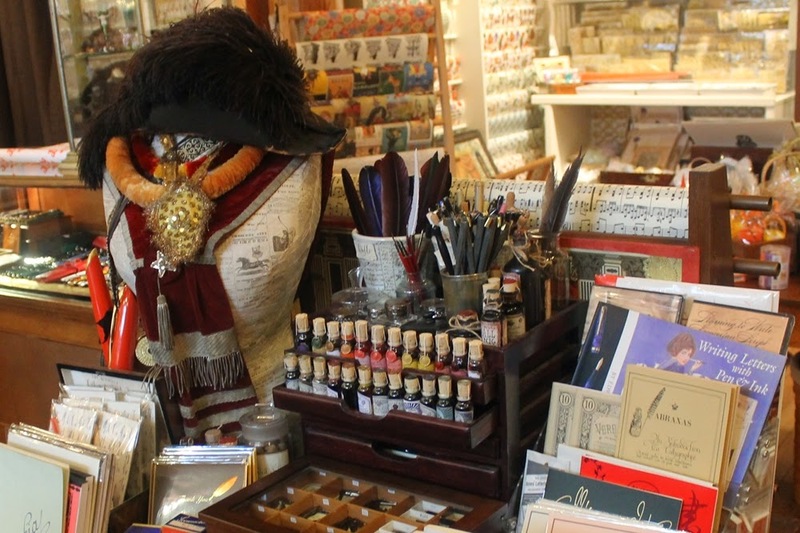 I asked if I could photograph the shop and they did not mind at all. I hope to make it there again this September after the Hallowe'en and Vine show. Thanks for sharing this Len! SO much eye candy! Thanks Leah. It was very difficult to choose pictures so after a while I put a lot of them up and took them out as I realized that some were not necessary. 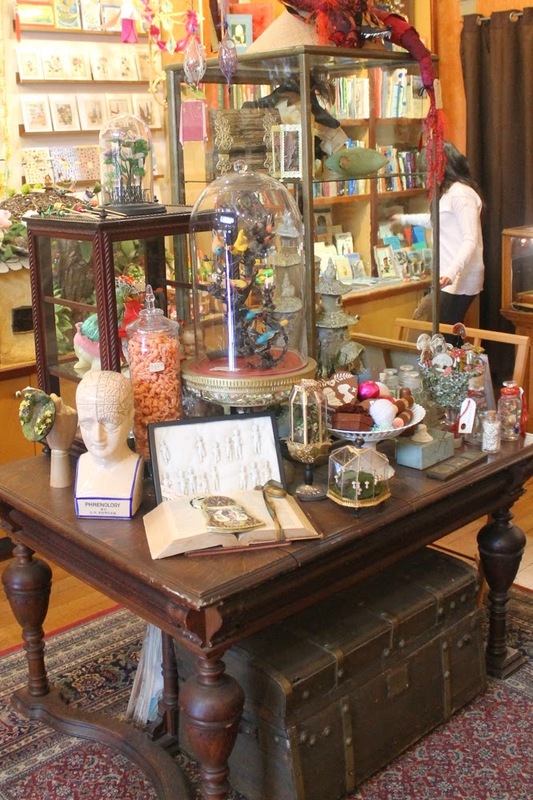 There are still a lot of pictures but the store is quite wonderful, I wanted to do it justice.